The Cavaliers new sports talk show, “CavsHQ” won its first Emmy in its debut season. The Cleveland Cavaliers walked away winners after receiving two Emmy Awards at the 48th Annual National Academy of Television Arts and Sciences Lower Great Lakes Chapter Emmy Awards Gala. One award was for an insightful conversation about a scar from the past, and the other for a long-awaited celebration for the ages. The Cavaliers new sports talk show, “CavsHQ” won its first Emmy in its debut season. The Cavs own in-house team of producers received the award for Best Sports-Interview/Discussion for the special Hardwood Classics episode that featured Cavalier Legends Larry Nance and Craig Ehlo discussing the Cavs vs. Bulls 1989 NBA Playoff Eastern Conference series and “The Shot” with hosts Mike Snyder and Brad Sellers. The game-winning basket in Game 5, considered to be one of Michael Jordan’s greatest clutch moments, was at the heartbreaking expense of the Cavaliers and Ehlo. Sellers, a Clevelander (and currently the mayor of Warrensville Heights) who was a member of the Bulls, led the discussion of what could have gone different on that fateful night that has gone down in the annals of Cleveland sports history. Nance and Ehlo gave their unique perspective as well, which led to a fascinating discussion about the nemesis of Jordan in Cavaliers history. 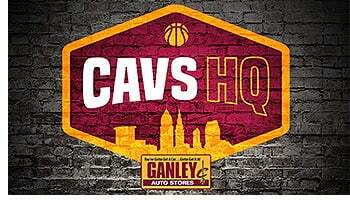 To view CavsHQ Episode #6, click here. CavsHQ is the flagship show of the Cleveland Cavaliers covering all things Cavs on and off the court. Guests include Cavalier players from past and present, as well as athletes and personalities with a Cleveland connection. A group of rotating hosts is led by Cavs broadcasters John Michael and Rafael Hernandez Brito and includes Mike Snyder, Brad Sellers, Scott Zurilla, Fred McLeod, Austin Carr, and Fox Sports Ohio’s Allie Clifton. Regular contributors Joe Gabriele of Cavs.com and Ryan Banks offer interesting viewpoints and review the Cavaliers’ place in the social media landscape. CavsHQ airs weekly on Fox Sports Ohio, the Elk and Elk Cavaliers radio network, and is also available on Cavs.com. The Cavaliers QTV team, Sr. Producer A.J. Johnson, Sr. Producer Paul Mazzoleni, and Director of Video and Sr. Producer Matt Eck also received an Emmy for their collaborative work with Think Media Studios in the category of Promotion-Program Sports. The Emmy recognized the group’s Cavs Championship “Rings” video specifically created for the raising of the 2016 NBA Championship Banner and Ring Ceremony on opening night of the 2016-17 season at Quicken Loans Arena. The video captured the emotions of the players, the fans and a city celebrating the first ever NBA Championship and professional sports championship for Cleveland in 52 years. To view Ring video, click here. The production team for the Cavaliers broadcast partner Fox Sports Ohio also took home Emmy awards for Sports Event/Game – Live/Unedited: Cleveland Cavaliers NBA Coverage. The honors went to Brent Valenti, producer; Fred McLeod, play-by-play; Austin Carr, analyst; Allie Clifton, reporter; Daniel Sevic, director; Patrick Kilkenny, coordinating producer; Karl Kronenberger, associate producer; Mitchell Hadden, videographer; and Tom Farmer, executive producer.